[118 Pages Report] magnesium alloys market is estimated to grow from USD 1.16 Billion in 2017 to USD 2.37 Billion by 2023, at a CAGR of 12.7% during the forecast period. The base year considered for the study is 2017, and the market size is projected for the period between 2018 and 2023. The increase in the use of magnesium alloys in the automotive & transportation and electronics end-use industries is expected to drive the market in the coming years. The report analyzes the global magnesium alloys market, in terms of volume (kilotons) and value (USD million). The report also estimates the size and growth potential of the magnesium alloys market across different segments, such as end-use industries, alloy type, and region. It forecasts the market size for five regions, namely APAC, North America, Europe, Middle East & Africa, and Latin America. The study also covers market opportunities and competitive landscape for stakeholders and market leaders. Key manufacturers of magnesium alloys include Magnesium Elektron (UK), Ka Shui International Holdings Ltd. (China), Magontec (Australia), US Magnesium LLC (US), Nanjing Yunhai Special Metals Co. Ltd., and Meridian Lightweight Technologies (US). The magnesium alloys market is estimated at USD 1.30 Billion in 2018 and is projected to reach USD 2.37 Billion by 2023, at a CAGR of 12.7% during the forecast period. The growth of the market can be attributed to the high demand for magnesium alloys from the automotive & transportation, electronics, aerospace & defense, medical, and power tools industries. The market has witnessed significant growth over the last few years, due to the increased demand for magnesium alloys for lightweight automotive parts. The magnesium alloys market is segmented on the basis of alloy type, end-use industry, and region. Based on alloy type, the market is segmented into cast alloys and wrought alloys. Cast alloys is projected to be the largest and fastest-growing segment of the market during the forecast period, owing to its large-scale applications in automotive & transportation, electronics, and other industries. Wrought alloys is estimated to be the second-largest alloy type in the magnesium alloys market in 2017 owing to its increasing applications in electronics, and aerospace & defense industries. Based on end-use industry, the magnesium alloys market is segmented into automotive & transportation, electronics, aerospace & defense, power tools, and others. Aerospace & defense is estimated to be the largest segment of the magnesium alloys market in 2018, owing to the growing demand for magnesium alloys from body structure and powertrain applications. The electronics industry is the second-largest consumer of magnesium alloys. The penetration of magnesium alloys is increasing rapidly in the electronics industry due to its increasing use in 3Cs (cellphones, computers, and consumer electronics). APAC is estimated to be the largest market for magnesium alloys in 2017. China and South Korea are the major markets for magnesium alloys due to the rising demand for magnesium alloys from the powertrain, body structure, cellphones, computers, and consumer electronics applications in these countries. These countries have also shown a rapid increase in the number of smartphone users in the recent past that is expected to continue over the forecast period. Uncertainty of magnesium prices and issues related to weldability and corrosion resistance are the major restraints for the growth of this market. 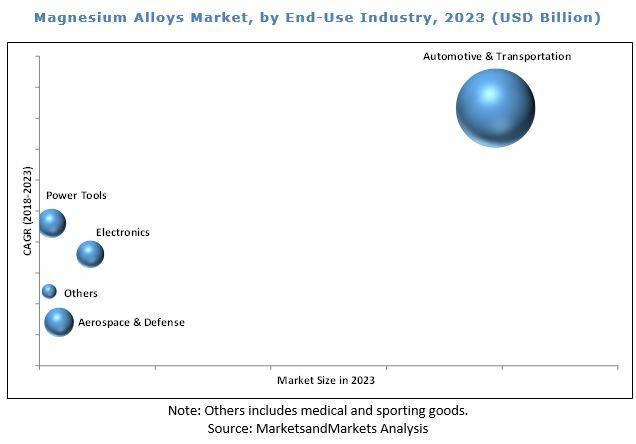 The main opportunity for the market is the growing demand for magnesium alloys from the medical (biomedical) and aerospace & defense industries. The growing market for electric vehicles is also a potential opportunity for the magnesium alloys market. Magnesium Elektron (UK), Nanjing Yunhai Special Metals Co. Ltd. (China), Ka Shui International Holdings Ltd. (China), US Magnesium (US), Meridian Lightweight Technologies (US), Shanghai Regal Magnesium Ltd. Co. (China), and Magontec (Australia) are some of the leading players in the magnesium alloys market. Magnesium Elektron (UK) has been focusing on maintaining its position in the market by tapping various global markets. The company had been involved in strategies such as new product launches, expansions, and joint ventures to increase its market share around the globe. The company has adopted new product developments as its major growth strategy in recent years. 10.2.1 Nanjing Yunhai Special Metals Co. Ltd.
11.2 Ka Shui International Holdings Ltd.
11.5 Nanjing Yunhai Special Metals Co. Ltd.
11.9 Shanxi Yinguang Huasheng Magnesium Co. Ltd.
11.10 Shanxi Credit Magnesium Co. Ltd.
11.11.9 Yee Dongguan Science and Technology Co. Ltd.
11.11.10 Taiyuan Tongxiang Magnesium Co. Ltd.